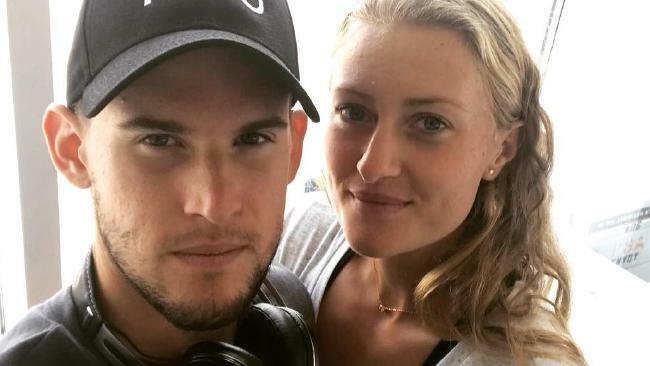 Dominic Thiem and Kristina Mladenovic’s romance was brought to light. JOHN Millman stunned the tennis world on Tuesday when he sent Roger Federer packing, but Rafael Nadal and Dominic Thiem upstaged those efforts with the match of the year. The top-seeded Nadal and the ninth-seed Thiem fought tooth and nail in a match that looked destined to never end. For Nadal he has now played in the two longest matches of the US Open after being pushed for four-hours and 23 minutes in the third round. Their epic encounter finally came to a close when Nadal managed to outlast Thiem in a gruelling fifth-set tie-break and advance 0-6, 6-4, 7-5, 6-7, 7-6. Thankfully for the Spanish master he'll now have two days off before he lines up against Argentinian third-seed Juan Martin del Potro in the semi-final. Fans in attendance and watching around the world couldn't believe what they were witnessing as the game crept past 2am local time. Nadal completed the remarkable victory despite being completely blown away in the opening set where he only managed to win a total of seven points. But as stunning as the contest was, fans were enamoured by the revelation of a bubbling new romance being brought to light. Spotted in the box of Thiem was Kristina Mladenovic who was eliminated in the second round by Carla Suarez Navarro. Mladenovic previously sat in the box of Thiem during the French Open and while their romance has been ongoing since last year, many fans only clicked thanks to the prime time slot of the contest. I keep forgetting Mladenovic and Thiem are a couple. But while the camera continually panned to Mladenovic cheering on every single Thiem point, she was just one of many big names in the crowd. The red carpet was rolled out for the contest with the celebrities definitely getting their money's worth. Celebrities sitting in the coaching box of top players is nothing new and for Rafael Nadal tonight it was actor Ben Stiller who got the birds eye view. NBA commissioner Adam Silver and Golden State Warriors coach Steve Kerr also watched on in amazement while Batman himself Michael Keaton marvelled at the superhuman efforts of the duo. Higher up in the stands saw an A-list double date with recently engaged Priyanka Chopra and Nick Jonas sitting with Nick's brother Joe and his fiancee and Game of Thrones star Sophie Turner. Along with the celebrities were the tennis die-hards with nobody coming close to topping this guy's love for Nadal. His efforts didn't top those of Roger Federer's superfan, but he gets an A+ for his choice of attire. Conditions throughout the Open have come under intense scrutiny with players battling to combat the stifling heat under the Arthur Ashe roof. It again took its toll on both Nadal and Thiem with the warriors sweltering through their gruelling battle. Nadal went through what looked like a thousand towels in his efforts to soak up the copious amounts of sweat, while Thiem wore through two pairs of sneakers. Thiem has sweat through two pairs of shoes. SHOES. This heat is absurd this tournament is absurd.